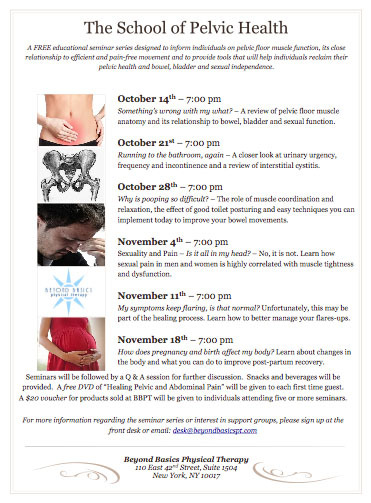 Join us tonight at Beyond Basics, 7:00 PM, for the next installment of The School of Pelvic Health. The next fascinating class is entitled Sexuality and Pain- Is it All in My Head? Stephanie will discuss how pelvic floor muscle tightness and dysfunction contributes to dyspareunia, pain with vaginal penetration, arousal, and erectile dysfunction. This, my friends, upsets me tremendously. Not only are some patients being mis/un-diagnosed with a proper diagnosis of pelvic floor dysfunction, but they are being told they are psychosomatic or simply too stressed. I like to make a clear distinction to my patients: It’s one thing to say it’s all in your head, and it is another thing to acknowledge there is a strong mind body connection. I believe in the latter, and many of my patients will admit they notice a worsening of symptoms when they are stressed. The reason for this is because stress affects our muscles and body in actual physical ways and the manifestation of these physical changes are often associated with muscle tightness and pain. To learn more about the mind-body connection and how it relates to PELVIC PAIN, be sure to join the class tomorrow night! We look forward to seeing you there!